To Cite: Jaafari-Ashkavandi Z, Hamedi A, Assar S, Ebrahimpour A. The Effects of Frankincense on Oral Squamous Cell Carcinoma Cell Line, Int J Cancer Manag. 2017 ; 10(5):e6416. doi: 10.5812/ijcm.6416. Background: Cytotoxic effects of Frankincense resin have been shown on some cancer cell lines. Due to its low side effects, this study was designed to evaluate the anticancer properties of water soluble elements of Frankincense oleo-gum-resin on human oral squamous cell carcinoma cell line. Methods: Oleo-gum-resin was macerated in ethanol. After filtration, the water soluble fraction of dried residue was extracted. KB cells were treated with 0, 62.5, 125, 250 and 500 μg/mL concentrations of obtained Frankincense aqueous fractions and with Doxorubicin as positive control. Frankincense induced cell cytotoxicity; apoptosis and proliferation were investigated using WST assay, Annexin V-FITC/PI, and Ki-67 staining, respectively. Data were analyzed using Kruskal-Wallis test by SPSS 17 software. 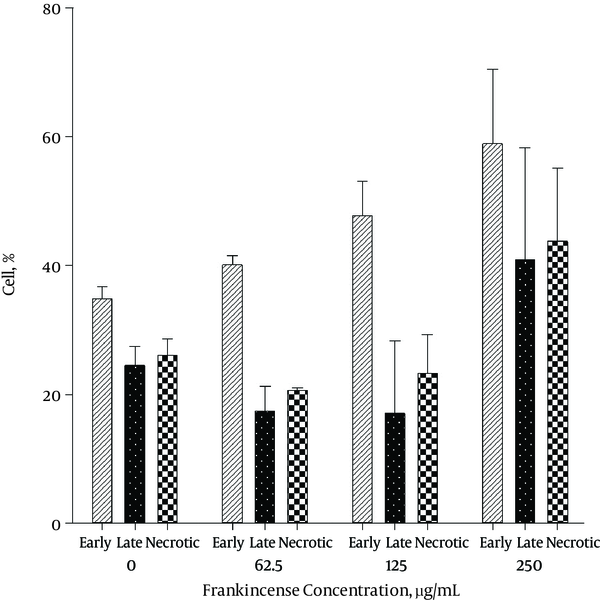 Results: IC50 of 137.21 μg/mL was obtained from Frankincense aqueous fraction after 48 hours. The percentage of apoptotic cells was elevated in a time- and dose-dependent manner. There was no statistical difference in the Ki-67 expression of KB cells, using different concentration of Frankincense aqueous fraction after 24 and 48 hours (P = 0.083). Doxorubicin inhibited cells growth essentially through apoptosis. Conclusions: Frankincense aqueous fractions seem to suppress KB cell growth through the induction of apoptosis and necrosis rather than the inhibition of proliferation and hence might be a potential anticancer agent. Structural analysis and purification of potent components are suggested for determining more definitive results. Oral squamous cell carcinoma (OSCC) is the sixth most common cancer in human (1, 2). Tobacco and alcohol use are two known risk factors for this cancer (3). Different therapeutic modalities (e.g. radiotherapy, surgery, chemotherapy) have been used for the treatment of OSCC with their harmful side effects. Chemotherapeutic agents have non-specific cellular effects and can cause diffuse cell death and tissue toxicity. Side effects like nausea, vomiting, neuro and nephrotoxicity and bone marrow suppression are among the most frequent side effects of these type of therapies (4, 5). The administration of herbal medicine, as an alternative treatment, is encouraged because of low toxicity on normal cells (6). Frankincense (oleo-gum), obtained from trees of the genus Boswellia, is a natural resin which has been used since ancient Egyptians. Fresh resin is milky and when dries, it changes to golden brown. Its final product is composed of 30% - 60% resin, 5% - 10% essential and aromatic oil (mostly monoterpenes), and 30% - 55% polysaccharides. There are various types of Frankincense trees, producing different types of resins in terms of their biochemical properties mainly because of different soil and climatic conditions in which they grow (7, 8). Different extracts from these gum-resins might possess anti-cancer properties (7). Most of the previous studies focused on essential oil or hydroalcoholic extract of this resin. Boswellic acids and alcohol soluble components of Frankincense were previously reported to exhibit cytostatic and apoptotic effects in multiple human cancer cell lines, including fibrosarcoma, meningioma, melanoma, leukemia and colon cancer (7). In some other studies, boswellic acid was shown to inhibit several signaling molecules such as 5-lipoxygenase, leukocyte elastase, cyclooxygenase (Cox) 1, and nuclear factor κB (NF-κB) (9). Moreover, direct anti-proliferative/pro-apoptotic effects of boswellic acid on leukemia cell lines by activation of caspase-3/8/9 were also described (10). Acetyl-11-keto-β-boswellic acid (AKBA), another derivative of Boswellia resin, was reported to potentiate apoptosis and inhibit angiogenesis in neoplastic cells (11). Since water solubility plays an important role in drug bioavailability, and Frankincense has low side effects on normal human tissues and also owing to its cytotoxic effects on some cancer cell lines, this study was designed to investigate the effect of the anticancer activity of aqueous fraction of Frankincense oleo-gum-resin on human OSCC cell line. The dried Frankincense gum resin was purchased from Shiraz herbal market and was authenticated by a pharmacognosist in the pharmacognosy department of Shiraz University of Medical Sciences. The voucher specimen was preserved with the code PM-177 in the herbal museum of the pharmacognosy department in school of pharmacy for further reference. Plant powder (100 g) was macerated with ethanol for 2 days. After filtration, the dried residue was extracted with distilled water for 2 days in a dark and closed glass container. The obtained aqueous fraction was concentrated with a rotary evaporator at 40°C and dried using freeze dryer. The dried fraction was weighed and kept in Teflon caped tubes in -20°C (12). Oral squamous cell carcinoma (OSCC) cell line (KB cell) was acquired from the Pasture Institute cell bank in Tehran, Iran. KB cells were cultured in RPMI-1640 and supplemented with 10% fetal calf serum for growth and 1% penicillin/streptomycin (Wexford, Ireland). Then, they were cultured in a 5% CO2 environment at 37°C. The cytotoxic activity of the Frankincense aqueous fraction and the standard anti-cancer drug (Doxorubicin, that has been shown to have anticancer properties against KB cells) against KB cell was evaluated using WST cell cytotoxicity assay. Cells were cultured in microplates (96 well, flat bottoms) with a final volume of 100 µL/well in a humidifier for 24 hours (37°C, 5% CO2) and a density of approximately 2000 cells/mL. RPMI was used to prepare different concentrations of Frankincense aqueous fraction (0, 62.5, 125 and 250 and 500 μg/mL), and Doxorubicin. Subsequently, the cells were incubated for 24 and 48 hours at 37°C, 5% CO2. Then, 10 μL of the WST solution was added to each well and incubated for 4 hours in 5% CO2 at 37°C. Finally, they were shaken for 1 minutes, and then the optical density (OD) of each well was measured by spectrophotometry at 440 and 600 nm with a multi-mode microplate reader. To evaluate cytotoxicity, we subtracted the culture medium background from our assay results and calculated percentage of cytotoxicity with the following formula, using average absorbance for controls and experimental results: (OD of experimental cells/OD of control cells) × 100 - 100. Finally, the IC50 values, the concentrations which inhibited 50% of cell viability, were obtained by plotting the percentages of cell death versus different concentrations of the plant extract and Doxorubicin using sigmoidal concentration response curve models by Curve expert software version 1.3. The cells were treated with Frankincense aqueous fraction (in 0, 62.5, 125 and 250 µg/mL concentrations) for 24 and 48 hours. Doxorubicin was used as the control drug. The necrotic and apoptotic cells were detected by staining the cells with Annexin V-FITC and PI apoptosis detection kit (ab14085), according to the instructions of kit's manufacturer (Abcam, Massachusetts, USA). The cells were analyzed on a flow cytometer (FACSCalibur, Becton-Dickinson, San Jose, CA), using Cell Quest software. The cells that were Annexin V (-) and PI (-) were considered viable cells; Annexin V (+) and PI (-), early-stage apoptotic cells; Annexin V (+) and PI (+), late-stage apoptotic cells and Annexin V (-) and PI (+), necrotic cells. KB cells (106) treated with 0, 62.5, 125 and 250 µg/mL of Frankincense fraction in 24 and 48 hours were transferred into a 1.5% of agarose and normal saline solution. Then, cells were fixed in 10% formalin for 24 hours. One paraffin block was prepared for each concentration. IHC staining for Ki-67 cell proliferation marker was performed on 4 µm sections. Briefly, sections were de-paraffinized with xylene and rehydrated in graded ethyl alcohol. Endogenous peroxidase activity was blocked with 3% hydrogen peroxide for 30 minutes. Ready-to- use Ki-67 (DakoCytomation, Denmark) was applied as primary antibody. Then, secondary antibody associated with Envision System was applied. 3, 3 diaminobenzidine hydrochloride (DAB) was used as the chromogen for antibody detection. Finally, sections were counter stained with Mayer’s hematoxylin. Basal cells of normal epithelium were considered as positive control. In order to obtain negative control, primary antibody was ignored. In each slide, 500 cells were counted twice and the percentage of positive cells with brown nuclei was analyzed using Kruskal-wallis test by SPSS 17 software. Cytotoxicity of Frankincense water soluble fraction increased from 14.93% to 95.19% in 62.5 μg/mL to 500 μg/mL after 24 hours and from 26.56% to 99.46% in 62.5 μg/mL to 500 μg/mL after 48 hours. IC50 of 202.52 μg/mL and 137.21 μg/mL were obtained after 24 and 48 hours, respectively. Cytotoxicity of Doxorubicin increased from 33.13% to 86.76% in 62.5 ng/mL to 1500 ng/mL after 24 hours and from 30.40% to 96.90% in 62.5 ng/mL to 1500 ng/mL after 48 hours. The IC50 for Doxorubicin was 428.95 ng/mL and 103.92 ng/mL after 24 and 48 hours, respectively. 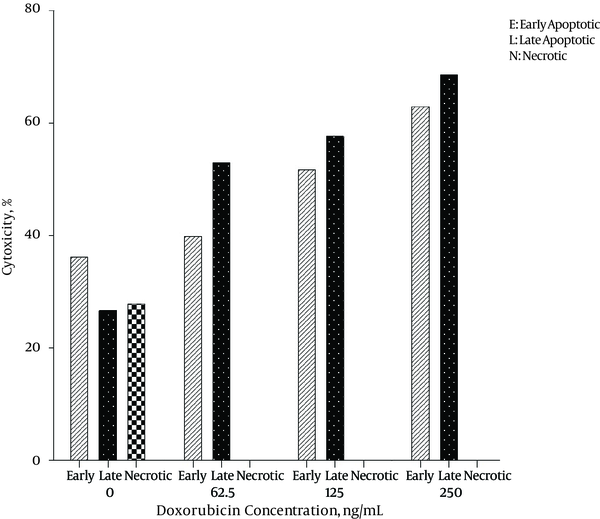 Figures 1 and 2 demonstrate the cytotoxicity effects of different concentrations of plant aqueous fraction and Doxorubicin after 24 and 48 hours. The results of Annexin V/PI staining for Frankincense after 24 and 48 hours are shown in Figures 3 - 5. 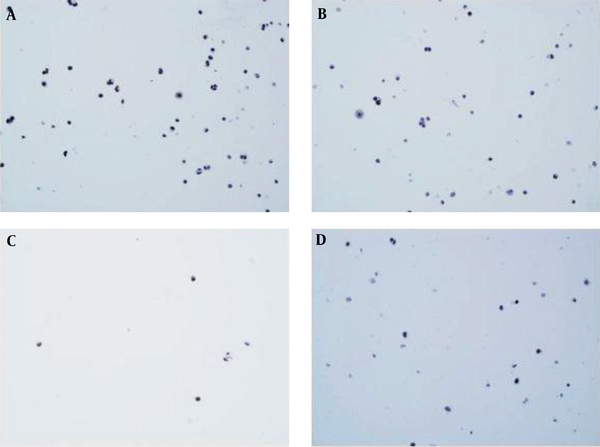 A, early apoptotic cells in Untreated KB cells after 24 hours; B, early apoptotic cells in 250 µg/mL concentration of Frankincense aqueous fraction after 24 hours; C, early apoptotic cells in Untreated KB cells after 48 hours; and D, early apoptotic cells in 250 µg/mL concentration of Frankincense aqueous fraction after 48 hours. 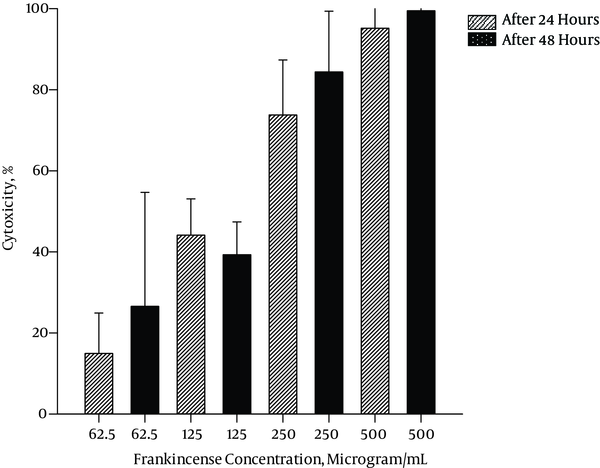 The level of apoptosis was the highest in 250 μg/mL concentration of Frankincense fraction. It was noticed that the percentage of early apoptotic cells was different from that of late apoptotic cells after 24 and 48 hours, respectively (21.1 ± 4.6% and 58.9 ± 11.5 % versus 9.8 ± 5.9% and 40.9 ± 17.3 %). 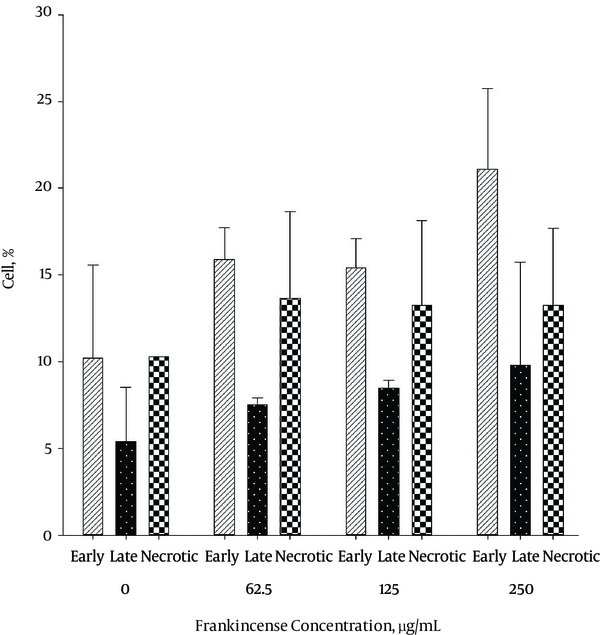 The highest level of necrosis was in 62.5 μg/mL concentration (13.65 ± 5.02 % after 24 hours) It was the highest in 250 μg/mL concentration of Frankincense (43.75 ± 11.3% after 48 hours). The level of apoptosis was the highest in 125 ng/mL concentration of Doxorubicin after 24 hours and its percentage was 52.3%. After 48 hours, the highest level of early apoptotic cells was 62.9% in 250 ng/mL concentration of Doxorubicin. 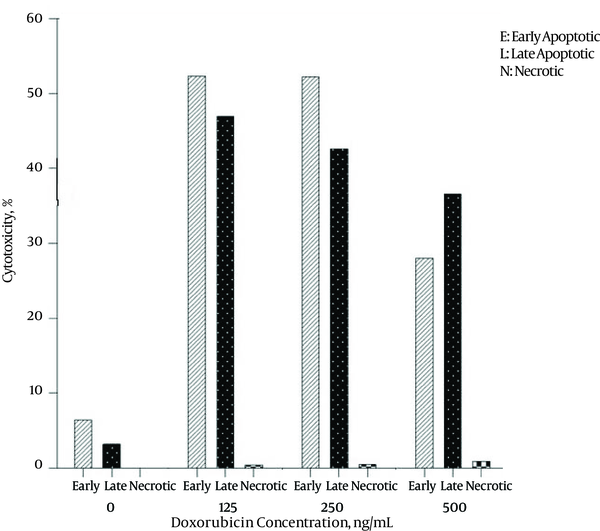 The level of necrosis was 0.9% with 500ngl/ml concentration after 24 hours and there was no necrosis after 48hours for every examined concentration. The results of Annexin V/PI staining for Doxorubicin after 24 and 48 hours are shown in Figures 6 and 7. Ki-67 labeling indices which were 64.5% and 55.5% in untreated cells decreased to 42.5% and 23.5 % in treated KB cells with 250 μg/mL of Frankincense fraction after 24 and 48 hours, respectively. Kruskal-wallis test showed no statistical differences in Ki-67 expression, using different concentration of Frankincense after 24 and 48 hours (P = 0.083) (Table 1 and Figure 8). aKruskal-Wallis test (P = 0.083). A, Untreated; B, 62.5 μg/ml concentration; C, 125 μg/mL concentration; D, 250 μg/mL concentration. Various clinical and experimental studies have shown the potential anti-cancer properties of Frankincense (13). In this study, we investigated the cytotoxic effects of Frankincense aqueous fraction on KB cells, a subgroup of Hela cells. Previous studies mostly focused on its hydroalcoholic extracts, essential oils or boswellic acid and its derivatives (7). However, owing to the effect of water solubility on drug bioavailability, this study focused on the effects of water soluble components of Frankincense. According to the results, the studied extract inhibited cell growth in a dose- and time- dependent manner. The highest cytotoxicity was observed in 250 µg/mL after 48 hours and IC50 was 137.21 μg/mL. To the best of our knowledge, there was no published article investigating the effects of the water soluble constituents of Frankincense on oral squamous cell carcinoma in Medline data base from 2010 - 2015. But Zhang et al. showed the preventive effect of boswellic acid in 5 and 10 mg/L on 7, 12-dimethyl benzanthracene(DMBA)-induced oral squamous cell carcinoma in hamster cheek pouch model (14). However, a number of preceding studies reported the growth inhibitory effects of different fractions or special compounds of Frankincense in various malignant cell lines. The IC50 values of Frankincense essential oil fractions for different cell lines are as follows: pancreatic pancreatic (1:270, 1:330, 1:550 and 1:1,300 dilutions for Frankincense essential oil with different fractions) (13) breast (80 μg/mL during 6 and 12 hours periods) (15) and colon (0.12 µg/mL at 48 hours) cancers (16). We could not find any study reporting the IC50 values of the oil fractions of this plant and their impacts on KB cells. Aqueous fraction of oleo-gum-resin is rich in different polysaccharides (8, 17, 18), such as 4-O-methyl-glucuronoarabino-galactan (19) 4-O-methylglucuronic acid (20). Polysaccharides from different origins have shown to have cytotoxic/anti-proliferative effects on various cell lines, including vascular smooth muscle cell (21), T-cell leukemia (22) and cervical cancer (23). The findings of this study exhibited the positive role of Frankincense polysaccharides in the aqueous fraction. However, more investigation is required to find water soluble fraction which may result in more active components in lower doses. As in clinical practice and some experimental studies, chemotherapeutic drugs, such as Doxorubicin, were applied on oral squamous cell carcinoma, we used this drug as a positive control in this study (24). The cytotoxicity of this drug in concentrations higher than 1500 ng/mL was nearly 100%. The IC50 of Doxorubicin was 103.92 ng/mL after 48 hours. In one study, the IC50 for Doxorubicin on KB cells after 3 days was 150 nM (23). In order to determine the probable mechanism of growth inhibition, apoptosis and proliferation markers were evaluated; the inhibition occurred through apoptosis and necrosis, as shown by Annexin V/PI apoptosis assay. In general, in low concentrations of resin aqueous extract, most of the cells were in the early apoptotic stage after 24 and 48 hours of treatment; but in 250 µg/mL concentration after 48 hours, late apoptosis increased. It was shown that Frankincense extract induced apoptosis in other cancer cell lines, such as bladder cancer by up-regulation of several pro-apoptotic genes, such as Il-6, CDKN1a and TNFa1 (10). Also, Frankincense oil revealed to have influence on the expression of Akt protein, an important protein in regulation of p53. In other studies, it was demonstrated that some transcription factors were up-regulated by Frankincense extract. This resin also activated caspase dependent apoptotic pathway, Akt and Erk1/2, and suppressed the expression of CyclinD1 in some cancer cell lines (7, 25). An important feature of necrosis was shown to elicit a pro-inflammatory response that might recruit immune cells to the tumor site, thereby increasing the efficacy of the chemotherapeutic agents. But the inflammatory response could be harmful for normal tissue, inducing the production of mitogenic or pro-survival cytokines. This could also activate the signaling pathways, promot cell growth and induce cell migration and tumor metastasis (26). 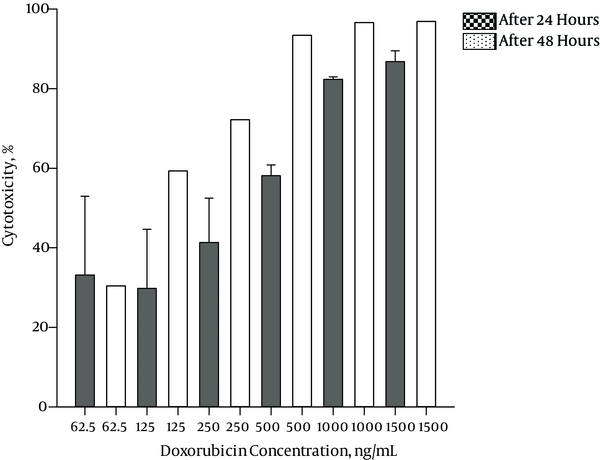 In our study, for Doxorubicin, as the amount of apoptosis is shown to be significantly higher than necrosis, it can be deduced that the mechanism with which Doxorubicin inhibits the cancer cells is through activating apoptosis. In contrast, the inhibitory mechanism for Frankincense water soluble fraction seems to be through activating both apoptosis and necrosis. Some chemotherapeutic agents, like taxels (in particular paclitaxel), cisplatin and fluorouracil, which are approved to be used in head and neck squamous cell carcinoma, function through inducing necrosis and apoptosis, and inhibiting migration (27). Ki-67 is a well-known used marker for investigating the proliferative activity of cancer cells (28, 29). It has a role in cell division by regulating cell cycle (30). In this investigation, there was no significant difference in Ki-67 expression between treated KB cells with different concentrations of Frankincense extract and untreated cells. The cytotoxic effects of resin fraction seemed to be more related to more inducing apoptosis than inhibiting proliferation. Specific roles and functions of Ki-67 in cell cycle control and cell proliferation are still unclear. Ki-67 is involved in independent cell cycle processes such as ribosome biosynthesis (23). According to results of one study, the cells which were negative for Ki-67 were not capable of executing mitosis and so they underwent apoptosis (31). According to the results of Etemadmoghadam et al.’s study, Doxorubicin might have a kind of inhibitory effect on Ki-67 protein, leading to apoptosis. For producing more protein, neoplastic cells would strive to survive from apoptosis by increasing their Ki-67 mRNA. Finally, protein production by the cells as well as apoptosis induction by drug would reach a balance resulting in a minimal change in Ki-67 levels after treatment (23). Their hypothesis might partly explain our findings concerning Ki-67 staining. Baisch showed that Ki-67 level elevated in tumor cells after cytokine- induced apoptosis (32). In contrast to our findings, some investigations demonstrated that Frankincense had a more obvious anti- proliferative effect than apoptosis induction effect on colorectal cancer cell line (11). The present study showed anticancer effects of Frankincense water soluble fraction on KB cell line with IC50 of 137.21 μg/mL after 48 hours treatment. This activity seems to be more related to the induction of apoptosis and necrosis than to the inhibition of proliferation. Frankincense may possess anticancer agents; however, structural analysis and purification of potent components are suggested for determining more definitive results and for enhancing the possibility of using Frankincense in invivo- studies. This manuscript is based on the postgraduate thesis of Dr. Sepideh Assar. The authors are also grateful to dental research development center of Shiraz dental school. This research program was funded by vice-chancellery of Shiraz University of Medical Sciences (grant #94-01-03-9730). The authors would like to thank the research consultation center (RCC) of Shiraz University of Medical Sciences for their invaluable assistant in editing this article.